What’s a party without a little sparkle? 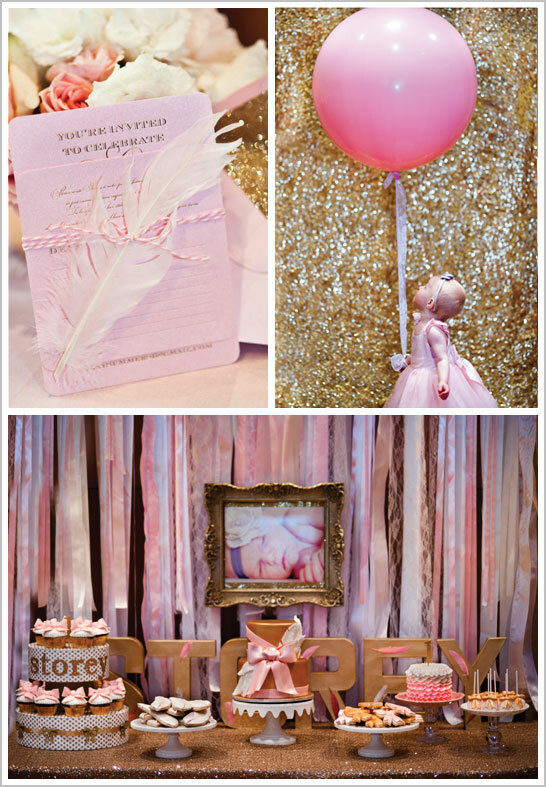 From shimmering gold to pink bows and feathers, this first birthday party really shines. Little girls and big girls agree… all that glitters is gold! And today’s party is no exception! With incredible sweets created by our friends at Intricate Icings, this was definitely one sweet affair. Dazzling cakes, cookies and cake pops all inspired by the party invitation. Plus a mini, ombre-ruffle cake, made especially for the birthday girl! Love, love, love it! 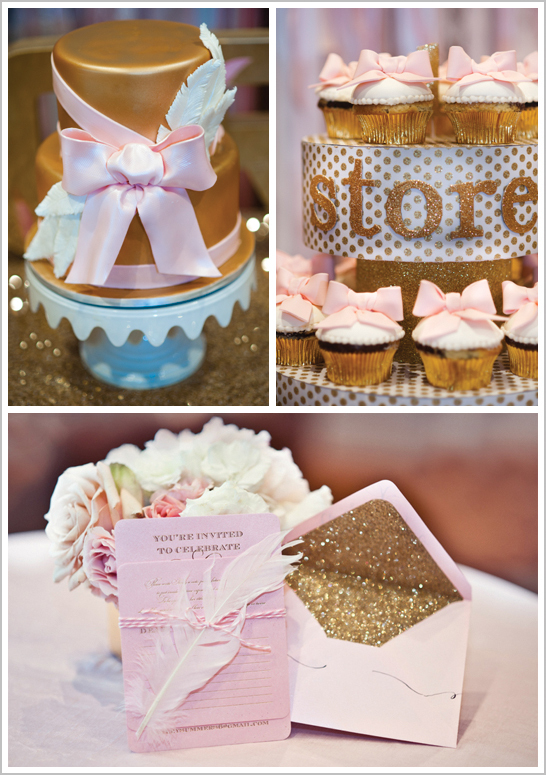 We’re just beaming over this Glittering Gold & Pink 1st Birthday…. First, check out THE most adorable smash cake ever! Ombre. Ruffles. And a glittering #1. Does it get much better than this? Only when the birthday girl digs into this mini ruffled buttercream cake, made just for her! The invitation provided the inspiration for the cake, cupcakes and cookies. 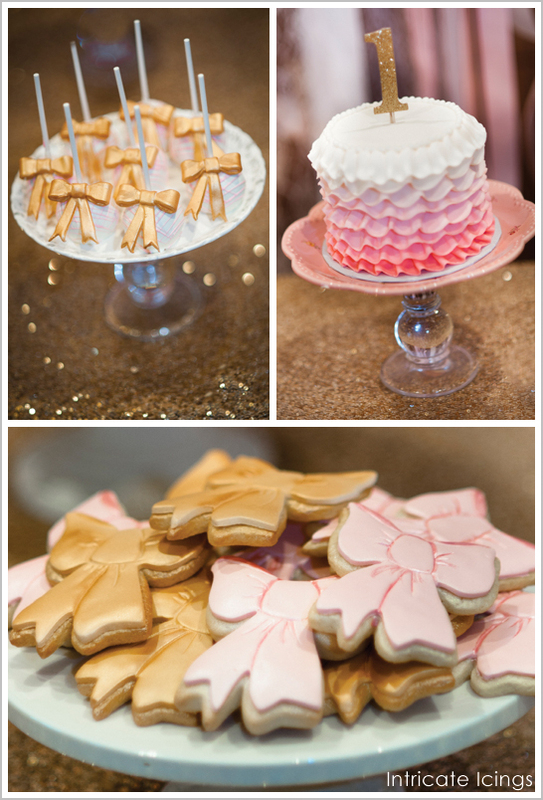 Shimmering gold, pink bows plus a few edible feathers to complete the look. Even the cupcake stand was glittering with fun (and the birthday girl’s name, Storey)! 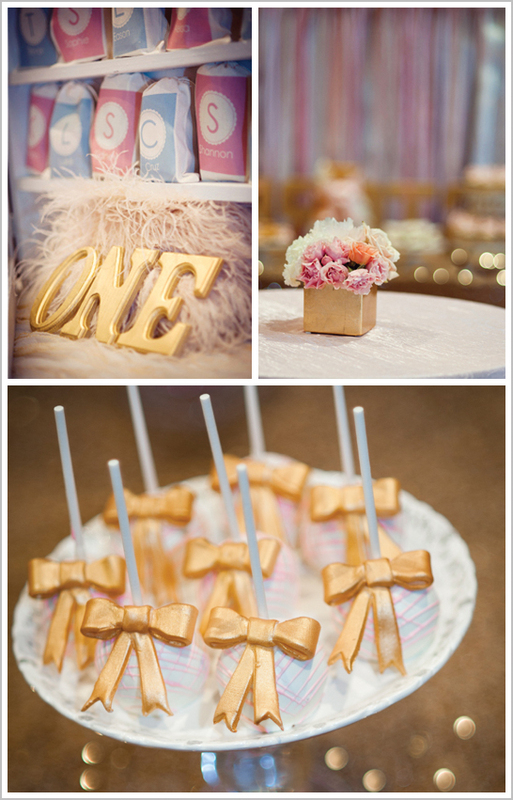 Golden bows made from modeling chocolate take these cake pops to a whole new level of fabulous! 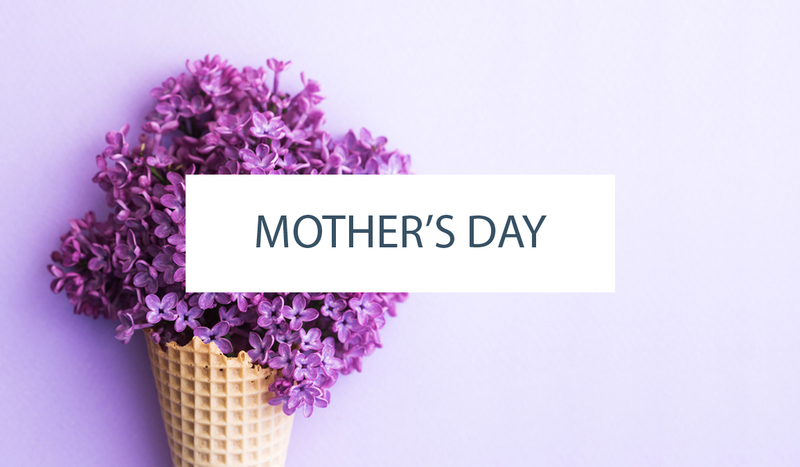 They pair perfectly with charming pink and gold bow-shaped cookies. A bedazzled photo booth with a sparkly gold backdrop set the stage for guests to strike a pose. And the perfect setting to capture this sweet moment… the birthday girl and her giant pink balloon! From the ribbon backdrop to the glittering gold tablecloth and everything in between, we’re loving the sparkle! Thank you to Rachael at Intricate Icings and Krista at Artessa Photography for sharing this Glittering Gold & Pink Birthday Party with us! It all looks too gorgeous to be real!! Stunning. I am in love with this party and all of its shimmery goodness!! 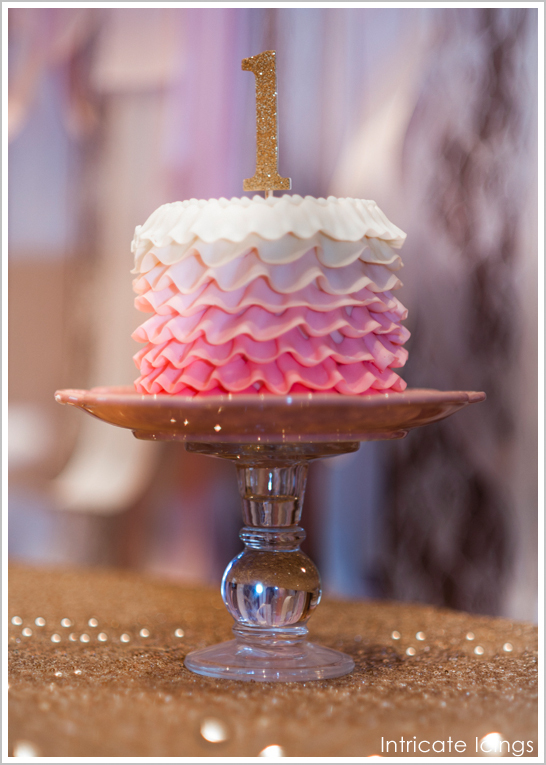 What tip did you use for the ruffle cake? WOW I agree with Krista, looks too beautiful to be real!! Love love love all the details. I’m so glad a pretty party like this was held in Denver, and not L.A.! Lovely party! My Goodness! What a beautiful party! I love the picture of the birthday girl and her giNORmous balloon. Beautiful!! Love the color scheme and ALL the fab details. FYI, the Nuage link isn’t working…. 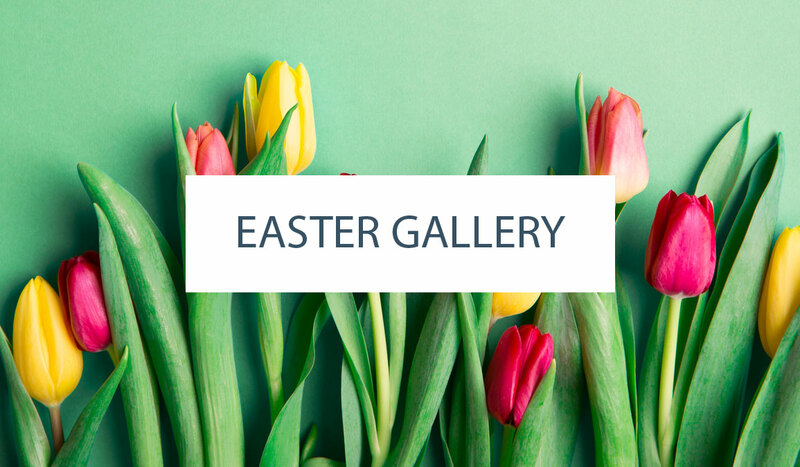 Ebony – thanks for letting me know about the link! All fixed now! SOOO pretty! LOVE IT! and i would love to know how you did the ruffle cake!! The ruffles were made with buttercream and a rose tip. Add a little giggle up and down as you pipe. I love over the top parties for baby’s first birthday & love every detail with this one! Super cute!! Way to cute to eat! What beautiful work! Love every last thing about this!! I love love the details! I am wondering where the beautiful pink dress is from? Thanks! Anna – I’m not aware of how much ribbon was used for this party. You could try asking the event planner to see if she remembers how much was used. Amazing party details! In love!! Where can I possibly find the glittering gold table cloth?? Where did you get the glitterin gold number 1 one the smash cake?! I love it! Doing the same color scheme for my daughter! !